More than a thousand people gathered in Piccadilly Gardens for an impromptu free gig from Dub Fx. The hip hop, reggae and drum and bass star performed at the Manchester Academy on Friday night - but he proved he hasn't forgotten his street-performing roots with the encore on Bank Holiday Monday evening. Setting up in front of the Big Wheel, the Aussie performer, real name Benjamin Stanford, was soon surrounded by a growing crowd of fans dancing to his sound, complete with trademark live looping and effect pedals. 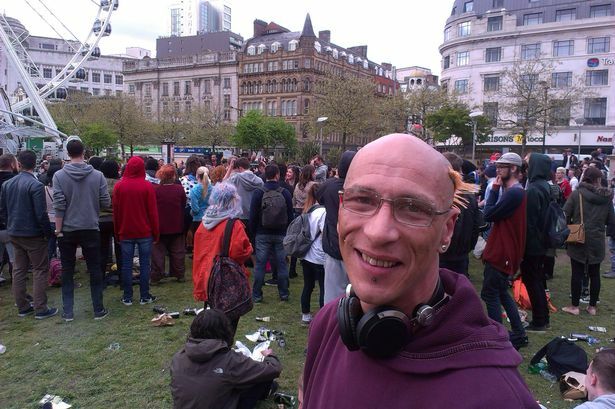 Paul Ingham, from Gorton, said: "I missed the gig on Friday so I'm really really happy I got here. "He started off as a street busker so going round the street doing his music, someone spotted him and gave him a record deal. "He's had three days in Manchester and now he's entertaining everyone. "I was worried I'd get here and he'd be gone. "I think he's brilliant, absolutely amazing, what he says is conscious spitting - he means things he says about this lovely world we are living in at the moment, so full respect to him." Many in the crowd had heard about the gig on Facebook and they looked set for a good evening.